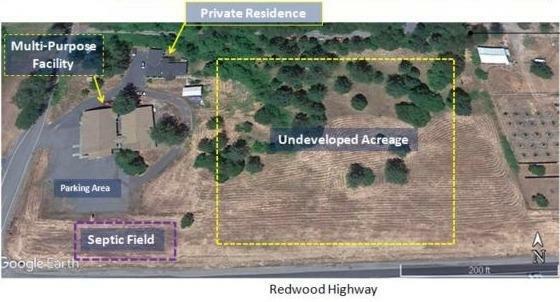 4.97 acres zoned RR-5 with a 7,130 sq ft building with a large paved parking lot. The building, built in 2000 and expanded in 2005, includes a large common area, foyer, central meeting room, three smaller multipurpose rooms, two sets of restrooms and kitchen. Also on the property is a well-kept 3 bedroom 2 bath 1,761 sq ft private residence with large deck and attached garage.